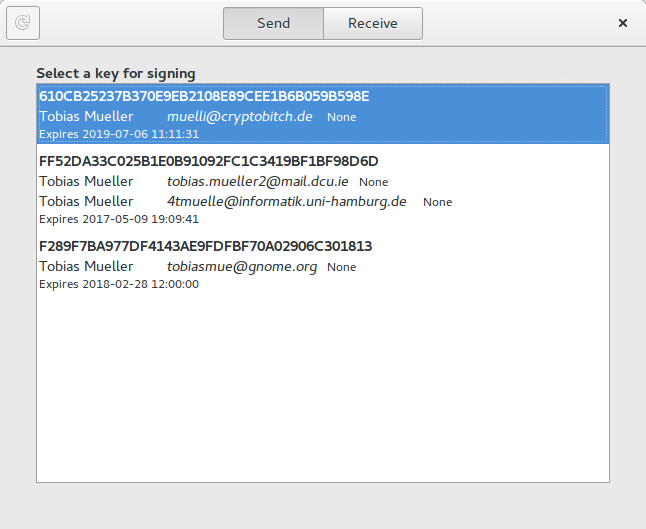 I’ve just release GNOME Keysign 0.8. It’s an exciting step towards a more mature codebase with less cruft and pieces of code moved to places where they should be more discoverable. To get the app, we have a tarball as usual, or an experimental flatpak (see below). Also notice that the repository has changed. The new URL should be more discoverable and cause less confusion. I will take down the old URL soon. Also note that this release will not be compatible with older releases. So you cannot find older clients on the network. Another fix went into the HTTP client side which you could stall with a non reacting keyserver, i.e. when the HTTP request was simply not answered. Because the download is not done asynchronously as it should, the UI waits for the completion of the download. The current mitigation is to let the HTTP request time out. A new thing is a popup when an uncaught exception happens. It’s copy and pasted from MyPaint and works by setting Python’s sys.excepthook. You can also now switch the screen on which the fullscreen barcode is being shown. Once you have selected a key, you get the barcode displayed. If you click it it will cover your whole screen. If you are hooked up to a projector you might want to make sure that the barcode is shown on the bigger screen. Now you can press the left or right key to “move” the barcode. 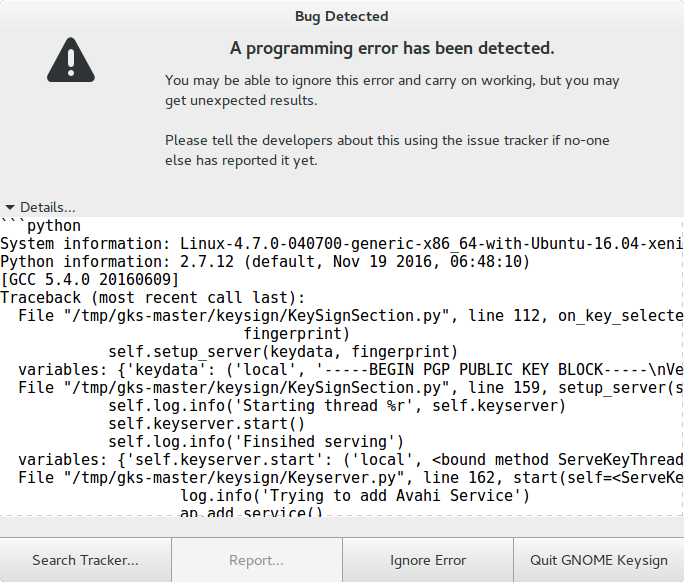 I needed to work around a bug in GTK which seems to prevent gtk_window_fullscreen_on_monitor () from working. Finally, a new GPG abstraction consolidates all the required functionality into one module rather than having the required functionality spread around various modules. I named it “gpgmh” for “gpg made hard” which is a pun on “gpgme”, “gpg made easy”. The new module will also allow to use the real™ gpg module instead of the gpg executable wrapper provided by monkeysign. We cannot, however, switch to the library just yet, because it needs gpgme 1.8 which is too recent for current distros (well, Debian and Ubuntu). So we have to wait until we can depend on it. If you want to try the application, you can now get the Flatpak from here. It should be possible to install the app with a command like flatpak --user install --from http://muelli.cryptobitch.de/tmp/2017-01-29-keysign.flatpakref. You can also grab the bundle if you want. Please note that the flatpak is very experimental. It would be surprising if anything but showing the UI actually worked. There are several issues we still need to work out. 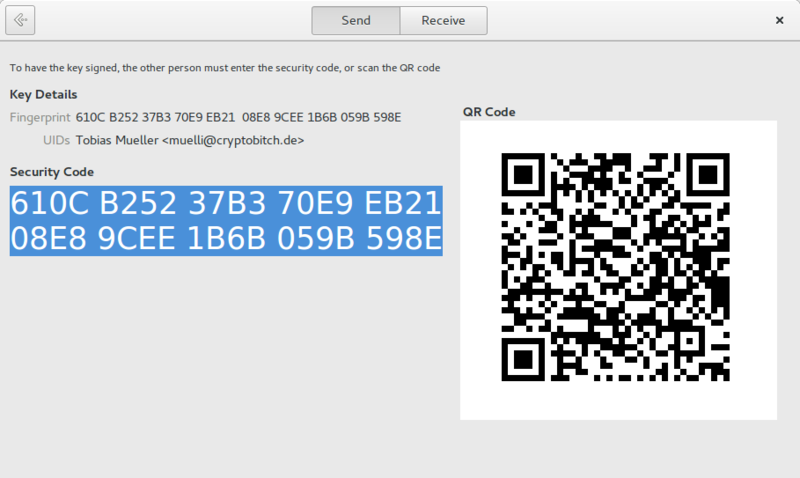 One is to send an email from within the sandbox and the other is re-use an existing gpg agent from the existing user session inside the sandbox. Gpg is behaving a bit weirdly there. Just having the agent’s socket available inside the sandbox does not seem to be enough to make it work. We need to investigate what’s going on there.